Don’t we all look forward to that cup of tea early in the morning? It is because a cup of tea makes us feel fresh and rejuvenated to begin our day, after a good night’s sleep. Even during a work day, when we feel drowsy or tired, a cup of tea is all that we need to get back to work. But, to derive maximum benefits out of the cup of tea, it should be devoid of caffeine. In fact, experts say that even negative emotions like anxiousness and sadness can be soothed with a cup of herbal tea. What is an Ayurvedic tea? Ayurvedic teas are caffeine-free herbal teas that are well-crafted based on your body need. They can help in balancing vata, pitta and kapha doshas and keeps the body and mind in harmony. Such teas can be safely consumed between meals, during meals or at any time of the day. They are also effective and economical too. There are plenty of ayurvedic teas that you can rely on for various needs of your body. Here, we have compiled a list of 5 best herbal teas that can help you to just relax and overcome negative emotions. 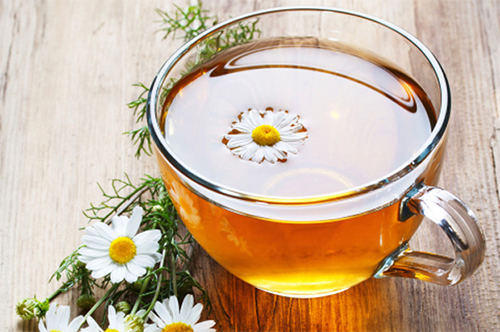 Chamomile is an ingredient often used in herbal teas, and is known for is calming effects. It helps alleviate sleep disturbances, relaxes blood vessels and helps relax muscle fibres. Chamomile has anti-bacterial properties, and is great for diabetics too. Mix 2 tsp of dried chamomile flowers in 2 cups of hot water. Allow it to seep in for 2 to 3 minutes. Strain and serve with honey (optional). This tea is traditionally indicated in ayurveda to overcome feelings of restlessness and imbalance. It promotes feeling of calmness, relaxation, and brings harmony to mind and body. It also helps combat mild insomnia too. Add dried licorice root to water ( 1 small dried root for 4 cups of water). Add in a small piece of cinnamon, half-inch piece of ginger, one clove and few fennel seeds. Allow the water to boil well. Remove from pan and let it steep for few more minutes. Strain and consumer warm. Add honey if required. Peppermint is known to help relax muscles. For best results, consume every evening, as it helps people suffering from insomnia. The presence of menthol helps relax muscles and makes you refreshed. Peppermint tea is ideal for people who are depressed and sleep-deprived. It aids digestion too. 1. Crush 7 fresh peppermint leaves and add to a cup. 2. Add hot water to the cup such that the leaves are immersed in it. Cover the cup with a lid. 3. Allow to steep for 7 minutes. 4. Strain and sip the tea. Add honey or lemon if you like. When consumed regularly, lemongrass helps prevent stress and worry. The energy-boosting properties of lemon grass helps in uplifting the mood. It ensures good blood circulation and boosts the metabolism, and leaves you with a positive frame of mind. 1. Cut off the root end of the lemongrass stalk and remove dry outer leaves. 2. Now, tie the lemongrass in a knot, and place it in a cup. Add a pinch of ground cinnamon and honey if required. 3. Add hot water to the cup, cover with a lid and allow it to steep for few minutes. 4. Add lime juice or honey to taste. Fennel is a common herb that is often eaten post lunch or dinner in India for quick digestion. Fennel is great in addressing stress-related problems and colic, which may later lead to depression. Although fennel can be directly ingested, when had in the form of tea, it makes you feel refreshed. 1. For making fennel tea, you can use fennel seeds or fennel leaves. If using seeds, crush 1 tsp of fennel seeds in a mortar pestle. If using leaves, use the fine green leaves, rinse well. 2. Pour a cup of boiling water over them, and allow the seeds/leaves to steep in for about 10 minutes. Now, get ready to treat yourself with these herbal Ayurvedic teas and feel the difference yourself!